Seamless Wi-Fi access in public locations has heightened fixed and mobile network operators' interest in Next Generation Hotspot (NGH) Wi-Fi service offerings. The Wireless Broadband Alliance (WBA) announced the findings of a market study conducted with research firm Senza Fili. Interest in this technology has been fueled by the world’s largest operators and vendors recently completing a number of advanced trials of NGH which led to the introduction of critical features such as seamless authentication; automatic network detection selection, adoption and secure access. This will ultimately give mobile device users easier access to a far greater number of public Wi-Fi access points around the world -- without the need for usernames and passwords. With an increasing number of sophisticated and data hungry mobile devices now available on the market, mobile network operators have been forced to address the capacity conundrum and Wi-Fi has proven to be a viable solution. However, there is a need to move beyond legacy hotspot Wi-Fi and upgrade to NGH that today boasts secure authentication and automatic service discovery and selection -- it will soon include online signup and policy support. The study examined the cost and revenue benefits that NGH will bring to fixed and mobile network operators. Exploring the cost savings from NGH Wi-Fi adoption as a complement to 3G and 4G wireless networks, it compared scenarios with varying percentages of traffic transported by NGH Wi-Fi, macro cells, small cells or legacy Wi-Fi. A higher proportion of data traffic carried by NGH Wi-Fi leads to lower per-bit costs. Mobile operators can reduce their per-bit RAN costs by 18 percent when they carry 20 percent of their traffic through NGH Wi-Fi. The combination of Wi-Fi and cellular small cells brings additional cost savings and higher profitability. The per-bit cost in a network with NGH Wi-Fi and 4G small cells may be 38 percent of those of a 3G macro network. The ability of NGH Wi-Fi to drive more traffic than legacy Wi-Fi from the same infrastructure results in lower per-bit costs for NGH Wi-Fi over legacy Wi-Fi. If the traffic in a legacy network is 25 percent of that in an NGH Wi-Fi network, the overall per-bit costs will grow by 18 percent. Based on the potential cost savings and operator commitments, it is forecasted that NGH Wi-Fi to account for 9 percent of global mobile traffic and reach $150 billion in operator revenue by 2018. "The technology behind NGH has been proven both in the lab and in the field. 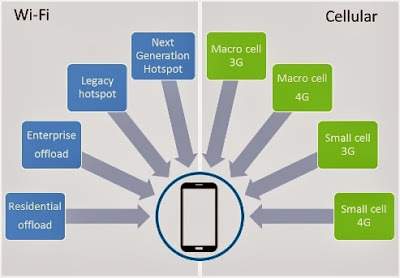 This study presents the critical piece of the puzzle for mobile network operators, demonstrating the strong business case for deploying the technology," said Shrikant Shenwai, CEO, Wireless Broadband Alliance. This new generation of Wi-Fi infrastructure will not only deliver a completely seamless and ubiquitous Wi-Fi experience to the end user, but will also become a key component of an operator's RAN and network optimization strategy, particularly when integrating Wi-Fi with LTE and small cells.